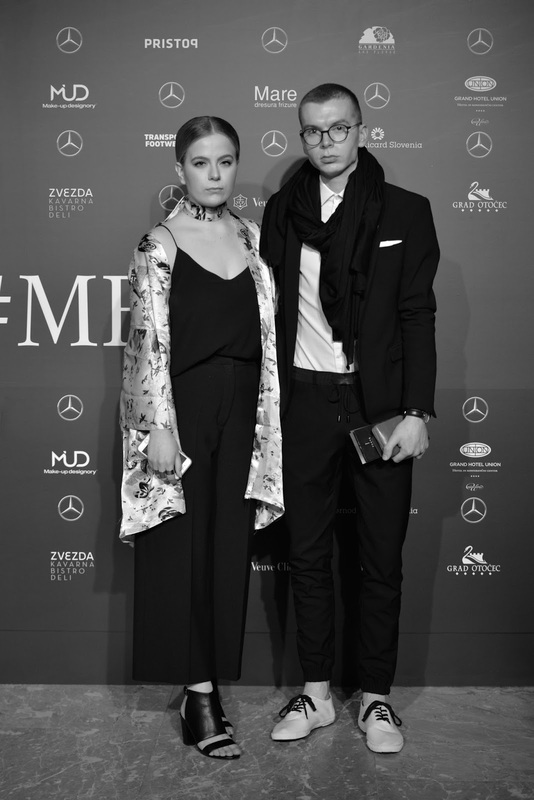 Mercedes-Benz Fashion Week in Ljubljana has come to an end. Day 3 was by far my favourite, because it was much more relaxed than the other two days. I also got to hang out with my "old squad", as we like to call ourselves, which makes the whole fashion week experience even better. We got to see the last 5 collections from Tanja Zorn, Natasa Persuh, Sari Valenci, IVANMAN and Charlie Design. Tanja Zorn presented her Dragonfly collection - an extremely detailed collection with a variety of textures in black and beige tones. IVANMAN's collection featured a perfect combination of classic and avant-garde menswear, most memorable because of its interesting colour contrasts and amazing structured jackets. Charlie Design's collection was my favourite of the night because it included monochromatic, structured and extremely wearable pieces that left every minimalism lover speechless. It gave me so many ideas I could try out in the future, especially with accessories. I also had the opportunity to make a quick interview with Natasa Persuh and Sari Valenci, which I will post next week including their whole collections and my favourite, key pieces. Because I am part of the PRESS community, they (randomly) asked me for comments on the collections and featured a short clip of it in the official video for MBFWLJ. So freaking exciting! Go check it out if you'd like to - they've posted it on the official Facebook page. After a few drinks, ice cream and amazing cookies (brownies?) we decided to call it a night, because you know, it was day 3 and we were way too tired to continue. As vain as it may sound (hopefully not that much) I absolutely loved my day 3 outfit - relaxed, comfortable and featuring some key trends of the season. I should definitely make a kimono my signature outfit piece because I just love it so much. I paired it with a matching choker, simple black came, culottes and mules. I really enjoyed this season's fashion week in Ljubljana. Now we just have to wait until October, when MBFWLJ comes back around and we can make some new memories. If you would like to read more about my fashion week experience, featuring stains and rain, I've also written posts about Day 1 and 2. So go check it out!